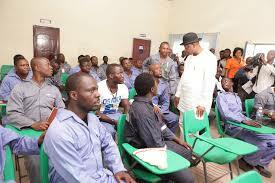 Some beneficiaries of the Presidential Amnesty programme have commenced a three-month rigorous Electrical Engineering training at the Izisco Ogbos Maritime Institute in Delta State, a statement by Mr. Wabiye Idoniboyeobu, Media Consultant to Brig-General Paul Boroh has revealed. “Izisco Ogbos Maritime Institute is the only recognized training institute in Delta State that offers courses in City & Guilds-London”, the statement stressed. Idoniboyeobu explained that City & Guild is a UK authorized certificate that can qualify the beneficiaries to undertake a Master’s Degree in any UK University. The certificate is also recognized by the National Board for Technical Education (NABTE), NIMASA and many other relevant International Agencies.